For other uses, see Kudzu (disambiguation). Kudzu spreads by vegetative reproduction via stolons (runners) that root at the nodes to form new plants and by rhizomes. Kudzu also spreads by seeds, which are contained in pods and mature in the autumn, although this is rare. [ citation needed] One or two viable seeds are produced per cluster of pods. The hard-coated seeds can remain viable for several years, and can successfully germinate only when soil is persistently soggy for 5-7 days, with temperatures above 20°C (68°F). Once germinated, saplings must be kept in a well-drained medium that retains high moisture. During this stage of growth, kudzu must receive as much sunlight as possible. Kudzu saplings are sensitive to mechanical disturbance, and are damaged by chemical fertilizers. They do not tolerate long periods of shade or high water tables. Kudzu was discovered July 2009 in a patch 110 m (360 ft) wide and 30 m (98 ft) across, on a south-facing slope on the shore of Lake Erie near Leamington, Ontario, about 50 km (31 mi) southeast of Windsor. Leamington is located in the second warmest growing region of Canada after south coastal British Columbia. For successful long-term control of kudzu, destroying the underground system, which can be extremely large and deep, is not necessary. Only killing or removing the kudzu root crown  and all rooting runners is needed. The root crown is a fibrous knob of tissue that sits on top of the roots. Crowns form from multiple vine nodes that root to the ground, and range from pea- to basketball-sized. The older the crowns, the deeper they tend to be found in the ground. Nodes and crowns are the source of all kudzu vines, and roots cannot produce vines. If any portion of a root crown remains after attempted removal, the kudzu plant may grow back. Mechanical methods of control involve cutting off crowns from roots, usually just below ground level. This immediately kills the plant. Cutting off the above-ground vines is not sufficient for an immediate kill. Destroying all removed crown material is necessary. Buried crowns can regenerate into healthy kudzu. Transporting crowns in soil removed from a kudzu infestation is one common way that kudzu unexpectedly spreads and shows up in new locations. Close mowing every week, regular heavy grazing for many successive years, or repeated cultivation may be effective, as this serves to deplete root reserves. If done in the spring, cutting off vines must be repeated. Regrowth appears to exhaust the plant's stored carbohydrate reserves. Cut kudzu can be fed to livestock, burned, or composted. ^ a b "Pueraria montana var. lobata". Germplasm Resources Information Network (GRIN). Agricultural Research Service (ARS), United States Department of Agriculture (USDA). Retrieved 11 December 2017. ^ "Kudzu". Merriam-Webster Dictionary. Retrieved 5 October 2017. ^ Vance, Timothy J. (2008). The Sounds of Japanese. Cambridge University Press. pp. 85–6. ISBN 978-0-5216-1754-3. ^ Labrune, Laurence (2012). The Phonology of Japanese. Oxford University Press. pp. 64–5. ISBN 978-0-19-954583-4. ^ "くず". Daijirin. Weblio. Retrieved 5 October 2017. ^ a b c John Everest; James Miller; Donald Ball; Mike Patterson (1999). "Kudzu in Alabama: History, Uses, and Control". Alabama Cooperative Extension System. Archived from the original on 16 June 2012. Retrieved 20 August 2007. ^ D. K. Jewett; C. J. Jiang; K. O. Britton; J. H. Sun; J. Tang (1 September 2003). "Characterizing Specimens of Kudzu and Related Taxa with RAPD's". Castanea. 68 (3): 254–260. ISSN 0008-7475. JSTOR 4034173. ^ Sun, J H; Li, Z-C; Jewett, D K; Britton, K O; Ye, W H; Ge, X-J (2005). "Genetic diversity of Pueraria lobata (kudzu) and closely related taxa as revealed by inter-simple sequence repeat analysis". Weed Research. 45 (4): 255. doi: 10.1111/j.1365-3180.2005.00462.x. ^ Amanda Allen (2000). "Kudzu in Appalachia". ASPI Technical Series TP 55. Appalachia -- Science in the Public Interest. Archived from the original on 28 September 2007. Retrieved 20 August 2007. ^ Chauvel, A; Grimaldi, M; Tessier, D (1991). "Changes in soil pore-space distribution following deforestation and revegetation: An example from the Central Amazon Basin, Brazil" (PDF). Forest Ecology and Management. 38 (3–4): 259–271. doi: 10.1016/0378-1127(91)90147-N.
^ William Shurtleff; Akiko Aoyagi (1977). The book of kudzu: a culinary & healing guide. Soyinfo Center. ISBN 9780394420684. ^ Wang, F. R.; Zhang, Y; Yang, X. B.; Liu, C. X.; Yang, X. W.; Xu, W; Liu, J. X. (2017). "Rapid Determination of 30 Polyphenols in Tongmai Formula, a Combination of Puerariae Lobatae Radix, Salviae Miltiorrhizae Radix et Rhizoma, and Chuanxiong Rhizoma, via Liquid Chromatography-Tandem Mass Spectrometry". Molecules. 22 (4): 545. doi: 10.3390/molecules22040545. PMC 6154678. PMID 28353641. ^ "Kudzu". Drugs.com. 2017. Retrieved 28 June 2017. ^ a b "Kudzu". Memorial Sloan Kettering Cancer Center. 2017. Retrieved 28 June 2017. ^ Shurtleff, William; Aoyagi, Akiko (1977). The Book of Kudzu: A Culinary & Healing Guide. Soyinfo Center. p. 9. ISBN 978-0-394-42068-4. Retrieved 25 October 2013. ^ a b Sandra Lynn Burney (2010). "Determination of antioxidant and total phenolic content of Pueraria lobata and evaluation of novel food products containing kudzu". Mississippi State University. ^ a b Marchese, C. Marina; Flottum, Kim (2013). The Honey Connoisseur. Black Dog & Leventhal. ISBN 9781603763325. ^ a b Doug Stewart (30 September 2000). "Kudzu: Love It or Run". Smithsonian Magazine. ^ Huang, Hsi-Ya; Hsieh, You-Zung (1997). "Determination of puerarin, daidzein, paeoniflorin, cinnamic acid, glycyrrhizin, ephedrine, and -gingerol in Ge-gen-tang by micellar electrokinetic chromatography". Analytica Chimica Acta. 351 (1–3): 49–55. doi: 10.1016/S0003-2670(97)00349-8. ^ Larry W. Mitich (January – March 2000). "Kudzu (Pueraria lobata (Willd.) Ohwi)". Weed Technology. 14 (1): 231–235. doi: 10.1614/0890-037X(2000)014[0231:KPLWO]2.0.CO;2. JSTOR 3988532. ^ Robert D. Tanner; S. Shahid Hussain; Lindsey A. Hamilton; Frederick T. Wolf (October 1979). "Kudzu (Pueraria Lobata): Potential agricultural and industrial resource". Economic Botany. 33 (4): 400–412. doi: 10.1007/BF02858336. ISSN 1874-9364. ^ Sibel Uludag; Veara Loha; Ales Prokop; Robert D. Tanner (March 1996). "The effect of fermentation (retting) time and harvest time on kudzu (Pueraria lobata) fiber strength". Applied Biochemistry and Biotechnology. 57–58 (1): 75–84. doi: 10.1007/BF02941690. ISSN 1559-0291. ^ Richard G. Lugar, R. James Woolsey. The New Petroleum. Foreign Affairs. 1999. Vol. 78, No 1. p. 88. ^ Jeffrey Collins (2003). "If You Can't Beat Kudzu, Join It". Off the Wall. Duke Energy Employee Advocate. Retrieved 20 August 2007. ^ Cain, Michael L.; Bowman, William D.; Hacker, Sally D. (2011). Ecology. Sinauer Associates, Inc. p. 246. ^ Tamura, Mioko; Tharayil, Nishanth (July 2014). "Plant litter chemistry and microbial priming regulate the accrual, composition and stability of soil carbon in invaded ecosystems". New Phytologist. 203 (1): 110–124. doi: 10.1111/nph.12795. PMID 24720813. ^ "SPECIES: Pueraria montana var. lobata". US Forest Service - United States Department of Agriculture. Retrieved 29 September 2015. ^ a b c d "Controlling Kudzu With Naturally Occurring Fungus". ScienceDaily. 20 July 2009. Retrieved 20 July 2009. ^ Bill Finch (September 2015). "Legend of the Green Monster". Smithsonian Magazine. Vol. 46 no. 5. p. 19. ^ "Kudzu: Invasion of the killer vines or a tempest in a teapot?". Chatham-Kent Daily Post. 27 September 2009. Retrieved 20 April 2010. ^ Wingrove, Josh (24 September 2009). "'Vine that ate the South' has landed in the Great White North". The Globe and Mail. Retrieved 14 October 2013. ^ Walker, Timothy (2013). Plant Conservation: Why it matters and how it works. Timber Press. p. 157. ISBN 978-1604692600. ^ Gigon, A.; Pron, S.; Buholzer, S. (2014). "Ecology and distribution of the Southeast Asian invasive liana Kudzu, Pueraria lobata (Fabaceae), in Southern Switzerland". Eppo Bulletin. 44 (3): 490–501. doi: 10.1111/epp.12172. ^ Gill, George (1 August 2002). "Kudzu vine an unwanted organism" (PDF). Biosecurity (37). ISSN 1174-4618. ^ a b c d e "Kudzu Control Without Chemicals". kokudzu.com. 2007. Retrieved 20 August 2007. ^ Bramlett, Betsy (31 August 2010). "Winston-Salem Using Goats To Attack Problem Kudzu Vines". Wxii12.com. Archived from the original on 6 March 2012. Retrieved 8 September 2010. ^ Neofotis, Peter. "Kudzu (Pueraria montana)". Introduced Species Summary Project. Columbia University. Retrieved 17 September 2011. ^ "Written Findings of the State Noxious Weed Control Board". Washington State Noxious Weed Control Board. 2007. Archived from the original on 27 September 2011. Retrieved 20 August 2007. ^ Matt Nespeca (August 2007). "Kudzu Control Methods and Strategies" (PDF). kokudzu.com. Wikimedia Commons has media related to Kudzu. 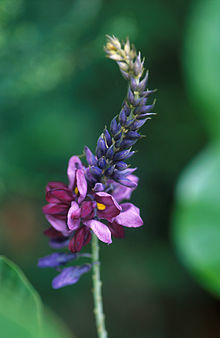 "Species Profile - Kudzu (Pueraria montana var. lobata)". National Invasive Species Information Center, United States National Agricultural Library. "Kudzu Vine - One of Ontario's Most Unwanted Invasive Plant Species" (PDF). Ontario Invasive Plant Council. Archived from the original (PDF) on 29 December 2015.